Steven Spielberg's Jaws, a brilliant film of so much more than just short shark shocks, changed the cinema experience forever. It was the original Hollywood blockbuster, the first film to gross more than $100 million. Nobody at the time predicted such remarkable success for Jaws. When Richard Zanuck, the Oscar-winning film producer who had been behind great films such as The Sound of Music and Butch Cassidy and the Sundance Kid, started on the project the book, by first-time novelist Peter Benchley, hadn't even been published and Spielberg's only feature film to date, The Sugarland Express, had yet to be released. The plot is relatively straightforward: a giant man-eating great white shark starts killing holidaymakers on the waters of Amity Island, a fictional New England resort. The local police chief, with the help of a marine biologist and a professional shark hunter, goes out to sea to track it down and kill it. The cast is magnificent but therein lies a story. Benchley had wanted Paul Newman to play police chief Martin Brody, Robert Redford to fill the role of hippy ichthyologist Matt Hooper and Steve McQueen to be grizzled shark hunter Quint. Zanuck wanted Charlton Heston, Sterling Hayden and Jon Voight respectively. In the end, the roles went to Roy Scheider, Richard Dreyfuss and Robert Shaw. As a trio, their chemistry is superb. Zanuck said he was conscious that having no star named added to the risks for the film but his three leads could not have been better.The main problem was the demanding practicalities of making the film. Jaws was shot on the small Massachusetts island of Martha's Vineyard (and on the waters surrounding it) and Spielberg, who was 27 at the time, remembers long days, with about four hours of shooting film and about "eight hours anchoring boats and trying to fight the ocean and get the shark to work". The sharks, in this era long before CGI, were a mechanical nightmare. "We were lucky to get one or two shots a day," said Zanuck. "The shark was a mechanical monster that very rarely worked. Actually, we had four of them, and they were all hydraulically operated - very crude by today's standards. "They had all these rubber-hose attachments, and there were 16 different parts that had to work - the eye, the jaws, the tail, the fins and so on. We had a barge bouncing up and down in the sea, with people at all these levers, each of them controlling a particular part. It was like an orchestra with these 16 guys on the barge, and they had to play it perfectly each time." But the mechanics just kept breaking down. For example, the shark would come out of the water with its eye closed, and we'd have to abandon the shot. It was so agonising. You'd have actors hanging around for days, waiting for just one shot." The problems ended up working in the film's favour. The opening segment is one of the most famous death scenes in movie history. Susan Backlinie was the skinny-dipping bather who takes a fateful moonlit swim, splashing about merrily. The silence is terrifying, the sea an endless dark pool. Suddenly, the whelping starts, the helpless struggle against a sea monster we are left to image, the creature that is dragging her under. It's an utterly terrifying moment. 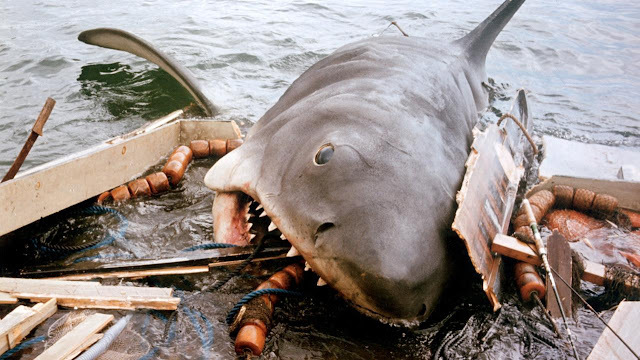 "In the script," said Zanuck, "we had the shark in that scene, but the mechanics weren't working. Steven made it so much more horrifying by having shots from underneath of the girl's legs dangling there, then the girl being ripped apart." All without the audience getting even a glimpse of her attacker. "If we'd had a computerised shark, we would have overdone it, and a lot of that suspense and build-up, which was not really intended, would have been lost. "Through the years, Steven has been praised for holding back on the shark and waiting, but it was never planned that way. We just didn't have it working." "Jaws was my Vietnam. It was basically naive people against nature, and nature beat us every day," Spielberg later said.The terror, panic and small town politics are all brilliantly done but this is also a film about bravery and friendship and the scenes in which the trio bond as they sit out at sea waiting to fight death itself are moving and witty. There is also a memorably great line. “We’re gonna need a bigger boat,” says Chief Brody when he finally realised the size of the beast they are facing.The beautifully simple and iconic movie poster, the evocative and haunting Grammy-winning score of John Williams (All together now: Duh-duh, duh-duh, duh-duh…) and the scary moments (the head and the boat) all help make Jaws one of the great films of the 20th century. Jaws won three Oscars - Best Film Editing, Best Original Dramatic Score, and Best Sound - and spawned three (poor) sequels. It is as thrilling today as when it first hit cinema screens on June 20 1975.